UMP | University of Minnesota Press Blog: Gail Langer Karwoski on writing the story of America's first legally married gay couple. 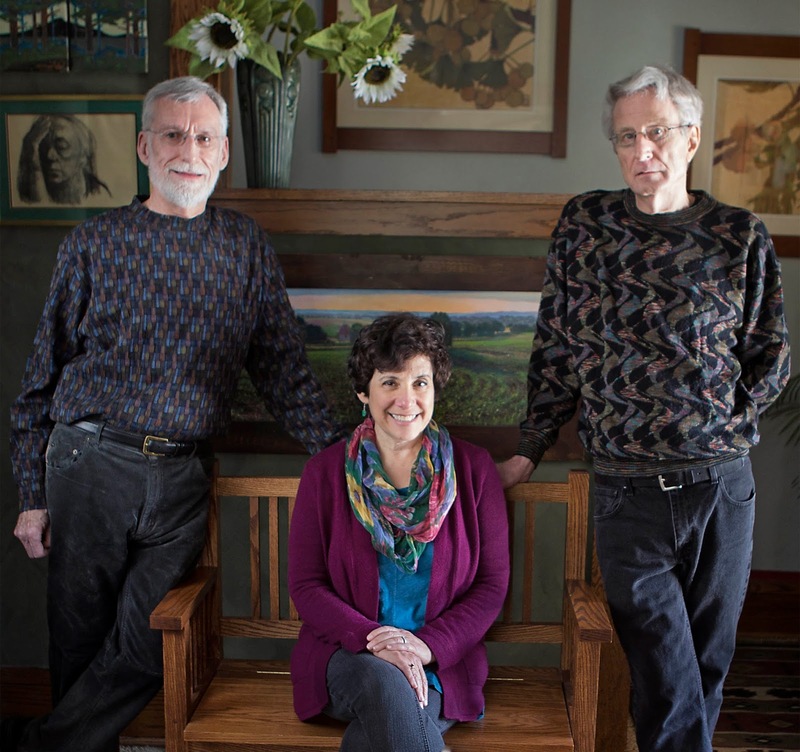 Gail Langer Karwoski on writing the story of America's first legally married gay couple. 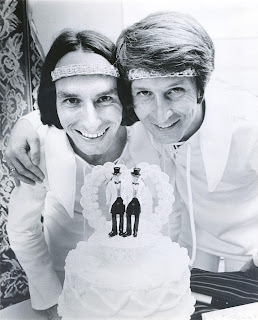 couples may exercise the fundamental right to marry." 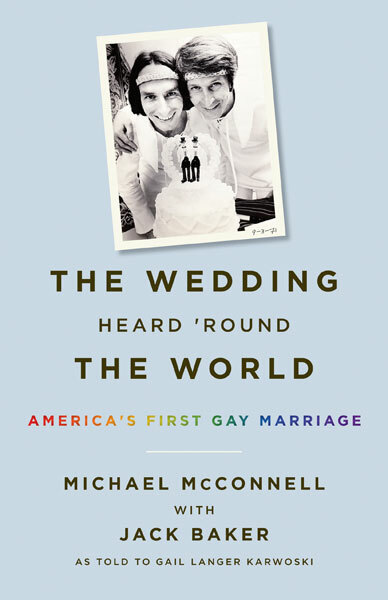 Writer Gail Langer Karwoski worked closely with Michael McConnell and Jack Baker, America's first legally married gay couple, to tell their story in The Wedding Heard 'Round the World: America's First Gay Marriage. See Gail's first piece about the project here. On a spring day in 2012, more than 40 years after I left Minneapolis, I got a call from Jack Baker. It had been decades since I’d last heard from him or Michael McConnell. I no longer had any idea what they were up to. 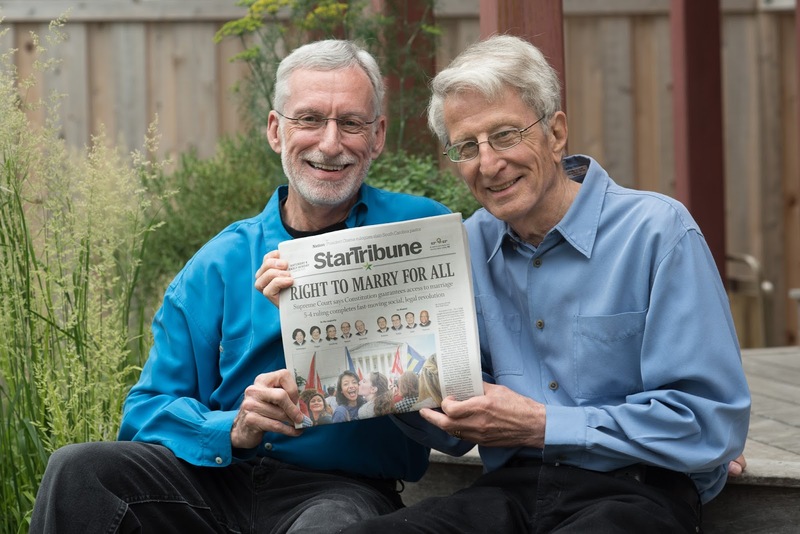 Never much for small talk, Jack got straight to the point: Gay marriage was sweeping the news, and the time had come for them to tell their story. Would I be willing to help? Me? Since I had moved to Georgia, I’d taught in public schools, raised two daughters with my professor husband, written more than a dozen children’s books, and turned into a grandmother. I was flabbergasted. Why me? I was intrigued. As a children’s book writer, I’ve always believed it’s my job to put my words to work making this world a better place. But after such a long time, could I collaborate with Jack and Michael? They would need to open not only their records, but also their hearts and their most intimate memories to me if I was going to help them tell their story. And life had taken us down very different paths. When I got their call, I was putting the finishing touches on a middle-grades novel, and I’d be starting a new project soon. I talked it over with Chester. He thought the idea was fascinating. Maybe I should consider it. I flew to Minneapolis. Jack and Michael picked me up. I wouldn’t have recognized them. The handsome 30-year-olds that I last saw in 1974 had become old men. Jack is still slim as a boy, but his once-piercing eyes have softened. Michael, ever neat and stylish, now has a mustache and beard framing his elfin grin. After a long catch-up over a delicious dinner (Michael is an accomplished chef), I went up to bed. I tossed and turned. The bed just didn’t fit me; it was hard as a brick. Maybe this was an omen? Michael and Jack had re-routed history by insisting on marriage equality. But was I the writer who could capture their accomplishments? Finally, I got up and found some pillows to pad the mattress. I decided I’d tell them this had been a mistake. We’d have a nice reunion and then I’d help them locate a writer who could do the job. In the morning, Michael noticed the clumps of pillows on the bed. Laughing, he showed me how to adjust their sleep-number mattress to fit me. That was a sign. As we talked at breakfast, I began to realize this project fit me perfectly. I knew how to explain complex material. I would be capturing the world that we had known, showing how we were and why things needed to change. Plus, I had Michael and Jack’s complete trust. During that first visit, we agreed that marriage was the heart and soul of their story. It’s what made their struggle unique and memorable. So we would begin the narrative when they became a “we.” Our goal was to reveal the up-close-and-personal side of events, so we chose the memoir format. Michael, with his friendly, inviting personality, would be the narrator. As we talked, the story began to slide into chapters. Michael and Jack on September 3rd, 1971. Two months later, I returned for our next session. Our collaboration found its own rhythm. We sat around their dining room table and I took notes. They argued, like all married couples, about the small details of a scene—who had been there, how long a meeting lasted, where people were seated, etc. Then we’d consult reports and news articles, matching memories with facts. My arms loaded with notes and documents, I’d trudge upstairs to Michael’s office, which he turned over to me whenever I visited. I’d work up a rough draft and run off a copy. Michael and Jack each read it and jotted comments in the margins. Jack, ever the lawyer, checked for legal accuracy. If there was a question about translating lawyer-speak into common prose, we got out the documents and pored over their wording. Jack made fewer notes on the margins, but he returned to the same point over and over in his dogged determination to be absolutely correct in the communication of legal information. We tailored our work routine around our personal habits. Jack sleeps in snatches. He’s in bed at nine and up by four to have his breakfast and put in a few hours of mental work before he catches his second sleep. Michael prefers to stay up until the wee hours. He winds down gradually for bed. I go to sleep around eleven and awaken at seven to work for an hour or so before breakfast. Jack would join me at breakfast, and I’d explain what I planned to write that day. When I went back upstairs, Jack would pull out relevant documents and update the running timeline for each chapter. Michael would jot down the people we should talk to or info we needed to dig up, like the songs of the period. In late afternoon, Jack and I would break for a several-mile walk while Michael prepared dinner. Then we’d gather around their table and review our progress as we ate. We’d go over their comments. Afterward, we spent the evening in their cozy upstairs den. We each savored a square of dark chocolate and a glass of wine as we watched the evening news. Michael has a large collection of movies, and he’d suggest a video. Sometimes we watched documentaries about gay history. Other nights, we watched Oscar winners, formulaic detective films, or even ridiculous spoofs. If the movie had sad moments, Michael set a box of tissues between us on their leather sofa because he knew we’d both cry. Jack would watch with us for a few minutes, then he’d say goodnight and go downstairs to sleep. On most visits, we’d get two chapters on paper. It was intense and exhilarating, and when I flew home, I was drained. In Georgia, I’d resume work but at a slower pace, sharing drafts with Michael and Jack by e-mail. Altogether, we spent nearly 4 years preparing Michael’s memoir. Gradually, our friendship deepened into something akin to family. Their words became my words, their struggles my struggle. Looking back, I realize this is what inspires all activism: no man or woman is ever truly free until we all are. Nobody is fully nourished until we are all fed. And I’m proud their story – my story – has ended in marriage equality for all Americans. Read Part One of Gail's story here.